Game changer, Atty. Glenn Chong swears that his network of volunteers will not allow election fraud to happen. Reacting to the report of his active poll watcher in Singapore, the Senatorial candidate #21 calls the Philippine embassy consul directly to warn him of possible cheating due to their private system of feeding the ballots into the VCMs. Only the Comelec, embassy officials, and accredited watchers can witness the process inside a private room. In the Philippines the public must be able to see visibly what’s going on outside the precinct at least. 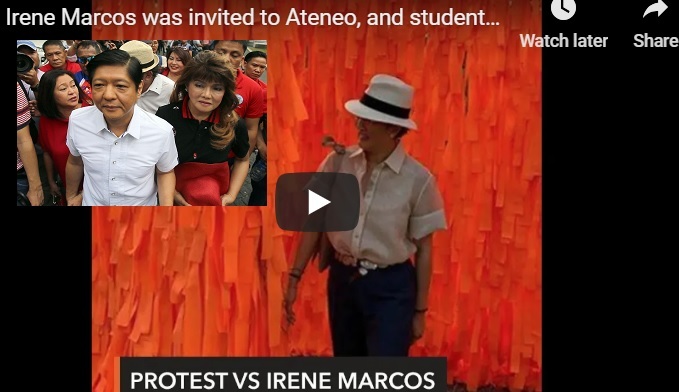 [VIDEO]: Irene Marcos was invited to Ateneo, and students are up in arms. Chong urges voters to please do not agree that doors and windows are closed in the embassies or consulate room where the admission of mailed in balloting takes place. It should be open to the public and the entire process must be publicly visible. When they hide in a closed room, all kinds of cheating can happen. 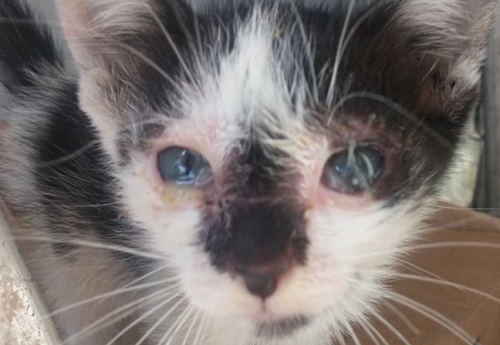 Please report immediately if this is not the case in your area, he added. Comelec must make it clear that they should not hide the ballot in the machine. Only thieves can do this. To avoid doubts, they must open the windows and doors. All Filipino citizens must be able to observe and watch if the want or need to, Chong clarifies. The clean election advocate and senatorial candidate is determined to influence the masses to help in winning the people’s campaign. This is to generate a fraud-free election despite the incompetence of the Comelec. He is grateful to the many ofws who are helping in their respective ways. Immediately after hearing that Imee Marcos and him are top one and two senatorial bets in Hong Kong, Chong immediately goes live on Facebook to address the worrying report from Singapore. Such action is a great help for what the country is fighting for. He is certain to win because of the people’s help. Atty. Chong promises to make it up to his voters as soon as he becomes a Senator. In the website of Philippines Embassy, Singapore, it says that The received ballot envelopes shall be opened by COMELEC-deputized Embassy officials only on Mondays and Thursdays for feeding into the Vote Counting Machines (VCM) (hours: 9:00 a.m. until completion of received ballots). This procedure can be observed by accredited Watchers only. An Atenean is one whose mind, body and spirit, have been molded according to the Jesuit philosophy of education. It is exemplified and implemented in various Jesuit-run Ateneo schools in the Philippines. The students are generally from wealthy families. Recently Ateneo students are demanding an apology when Irene Marcos was invited and attended the alumni event. 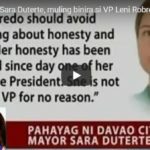 Acting like brats, they say that, ‘The role of Ateneo is not to condone the fabrication of lies, but to be a pillar of human rights in a society that celebrates the mockery of the truth.’ This is in unison to the hypocritical treatment of the UP and Princeton to Imee Marcos, another daughter of the late President, Ferdinand Marcos. They deny her of her credentials as influenced by the elite and activists. Ateneo De Manila University’s student council condemns the presence of Irene Marcos during the launch of the campus’ Arete Ampitheatre. It calls it a “mockery” and a “grave insult” to martial law survivors. In a statement , Sanggunian ng mga Paaralang Loyola ng Ateneo de Manila (Sanggu) demands an apology from the Arete administration. It wants an explanation of why Marcos, the third child of the demonized first couple Ferdinand and wife Imelda, was there in the first place. Sanggu said the amphitheater’s director confirms Marcos’ invite to the event. For them, it is “ironic.” Sanggu cites the use of the amphitheater to stage “Dekada ’70” and “Desaparecidos” – both depict the abuses during the administration of Irene’s father.They also refer to the the move as a “shameless compliance” and “disrespect” to Ateneo’s ideals. Doing so is like erasing crimes allegedly committed during Martial Law. Are elite Catholics this inconsiderate and judgmental to others? “Arete is the university’s central space for creative, adaptive, and independent thinking”. For them, those are the values that the Marcoses allegedly destroyed but this is contrary to the massive of Filipinos who are the witnesses of their pro-people but anti-oligarchy system of governance. Arete’s invitation is a is deal for them because to mingle with a Marcos appears as a form of shameless compliance to the very movement that the Ateneo vehemently opposes. They are afraid to erase the Martial Law propaganda from history. It might be beneficial to Imee Marcos’ campaign efforts for the 2019 Senatorial Elections where she runs as Senator. The eldest daughter of the ex-President Marcos runs for senator under the Nacionalista Party. She forges an alliance with Davao City Mayor Sara Du30’s Hugpong ng Pagbabago regional political party. This is Marcos’ first senatorial bid. Her brother Bongbong Marco is a former Senator from 2010 to 2016. His electoral protest against Vice President Leni Robredo awaits the decision from the Supreme Court. Gov. Marcos is a hot bet among overseas contract workers and would likely to win a Senate seat pretty soon. The highest official of Ateneo de Manila University apologizes for the said action and currently resigns from the post. 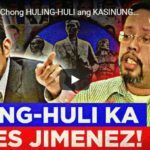 It is clear now that some Catholic institutions like schools and churches connive with the oligarchs whose businesses would likely suffer from the present administration in alliance with the Marcoses that prioritize the common Filipinos. No wonder the yellow media works overtime in discrediting the Du30 and Marcos families nowadays. The blame game is on the Liberal Party faction now that it has become very obvious that their Otso Diretso slate is getting absolutely unpopular. Mar Roxas has to change strategy. 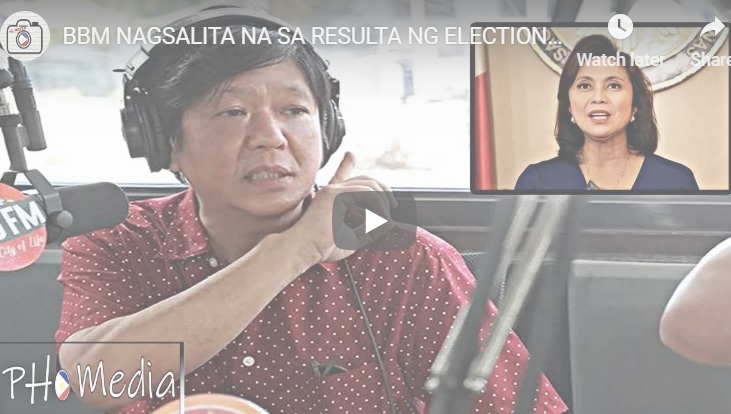 Kris Aquino hit out at the camp of Roxas over comments supposedly blaming her brother, former President Benigno Aquino III, for the Liberal Party standard-bearer’s loss in the 2016 presidential race. Bongbong Marcos was the focus of ex-Pnoy’s blocking promise from the VP post. Thus neglecting now President Rodrigo Du30’s victory over Roxas during the 2016 elections. 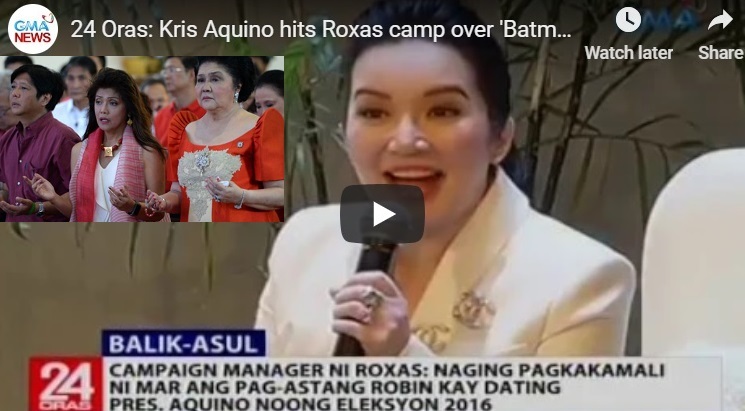 [VIDEO]: Kris Aquino hits Roxas camp over ‘Batman-Robin’ quip involving Noy. Actress, Kris Aquino and her brother ex-President Noy are not on speaking terms currently. 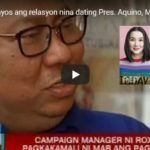 The rift was only about a social media post of the youngest sibling of the Aquino family saying that she knows why Du30 won in the 2016 elections over Roxas. Roxas is in denial over the LP feud. He said that maybe their political enemies are only looking for a big scoop to destroy them. He clarifies that there’s no misunderstanding at all between Noy and him despite Kris’ rants. Edgar Erice, Roxas’ campaign manager, said they decided on the color blue for his 2019 senatorial bid.”It was a conscious decision to change colors because one mistake that Roxas made in 2016 was acting like Robin to Aquino or the Batman. Robin will never be Batman,” Erice said, referring to the superhero duo of DC Comics. Kris, who is on social media, said that she has to speak up about the issue. “Really – to blame his loss on my brother? So, was it Noy’s fault that he lost in 2010 as well?” Kris said, referring to Roxas’ defeat in the 2010 vice presidential race. Who is Silent or Decent? Kris added that though we have a rift, when people disrespect my brother because he is decent and will just stay silent – they will read our truth. Does Kris really know what her brother did to Bongbong Marcos or to the Marcoses at that? She better know by now who keeps quiet because of his decency. Then, the truth will set her free. 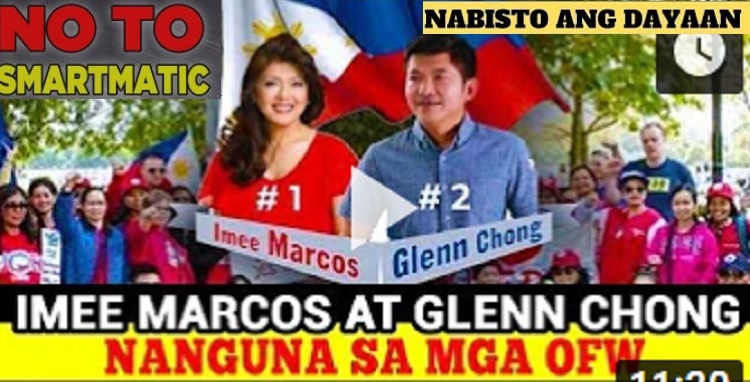 Who can Cheat the People’s Manang Imee Marcos this Election 2019? It is undeniable that the Filipino voters are now very vigilant with where their votes go to. This is the fruit of clean election advocate, Atty. 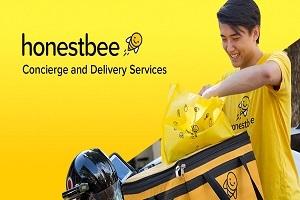 Glenn Chong’s labor. Gov. Imee Marcos who is the “manang” or older sister of Bongbong Marcos who’s electoral protest claims benefit from Chong’s initiative is grateful to the brave lawyer, accountant, and IT expert. They both campaign alongside each other. The Hong Kong voters, however, went out of the way to express their support to Marcos. Therefore, the New Marcosenos of Hong Kong was born. Then, after days of the absentee voting, Marcos is likely to be number one followed by Chong in the election 2019 senatorial race. [VIDEO]: Miss Imee Marcos is running for a Senate Office. Vote her this May 2019 election. The display of power in Hong Kong during the New Marcosenos of Hong Kong event was overwhelming. The honorable governor was the guest of honor. The crowd outside the venue cannot be compared to any campaign pickets. These are people who has loved the Marcoses for decades. Their voices can’t be ignored. The governor reminds the audience that their intention to make the country great again originates from the time of her father, the late President Ferdinand Marcos. Black media propaganda manages to taint his reputation but the love of his people remains. This can be seen through the eyes and actions of the overseas Filipino of Hong Kong. The great former president’s decree allows Filipinos to work abroad with the necessary protection. Honorable Marcos is a 3-time governor. She knows her people well because they are not camera-shy. The special mentions of the people who made the event possible were read by Marcos in a passionate roll call. Her impromptu words show how much she knows them by heart. She also calls out for her brother, Bongbong Marcos who is the real Vice President, she said. The crowd cannot help but scream upon hearing her utmost declaration. Star cruises now frequent Ilocos Norte for tourism. Tourists from China, Korea and other countries are eager to know the Ilocano local culture because of the Marcoses’ close ties with their leaders. Their unemployment rate is now very minimal. Other economic measures are already in place. It is in Marcos’ priority plan that to become an ofw should not be a sacrifice but an inspiration. One must have the choice to stay at home for a good life. Like the former First Lady, Imelda Marcos, the beauty, honor, and skills of Filipinos must be preserved. The older Marcos used to be the envy of the world for her charm and intelligence. Critics can only use her collection of shoes to discredit her. She was never desperate. In the same way, inspiration for a beautiful and progressive future must be the reason why a Filipino must leave the country and family and not a mere sacrifice. This is possible with the improving livelihood locally. Gov. Marcos’s solutions to poverty and sustainable development in Ilocos Norte are now for nationwide implementation.